I’m Charlie Nardozzi and this is the Vermont Garden Journal. You say potato and I say potato…. well when I say potato most people think of the white potato. 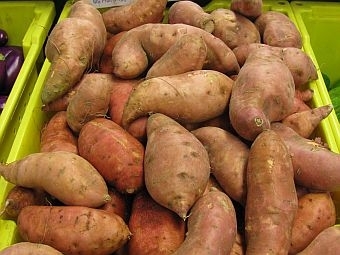 But globally the sweet potato is more widely known. This vining crop in the morning glory family hales from South America. Chris Columbus was the first European to discover the sweet potato on St. Thomas in the Caribbean. The natives called it batatas. That was translated into patata in Spanish and potato in English. In fact up until the 17th century, the potato in Europe referred to the sweet potato. Sweet potatoes are not a vegetable you normally think of growing in Vermont, but you can. It’s a warm weather lover that also makes an attractive ground cover. There are a number of ornamental sweet potato vines available exclusively grown for their foliage. They do produce edible tubers, but if you want good flavor, try the ‘Beauregard’ variety. Sweet potatoes grow best on a well-drained, loose soil amended with compost. Lay black plastic mulch over the garden area two weeks before planting. Transplant your locally purchased sweet potato slips after all danger of frost has passed. Let them grow all summer keeping them well watered. Once the foliage yellows, but before frost has blackened the vines, start harvesting. If you wait too long they may rot in the ground. Wait for a dry day and with a shovel or iron fork carefully dig the tubers not bruising the delicate skin. Leave the harvested tubers on top of the soil for a few hours to dry. Cure your sweet potatoes in an 80F, well ventilated room for 10 days. This will help transform the starches into sugars. Store them in a 55F degree room. Now for this week’s tip, those white, fuzzy caterpillars that are crawling all over plants and buildings are tussock moth larvae. They only cause damage in high numbers and are easily controlled with sprays of Bt. Next week on the Vermont Garden Journal, I’ll be talking about a collection submitted to the Vermont Garden Journal’s Facebook page. For now, I’ll be seeing you in the garden!